Ultimate Jam Night To Present Free Show At NAMM With Renowned Performers - Welcome To All That Shreds Magazine! 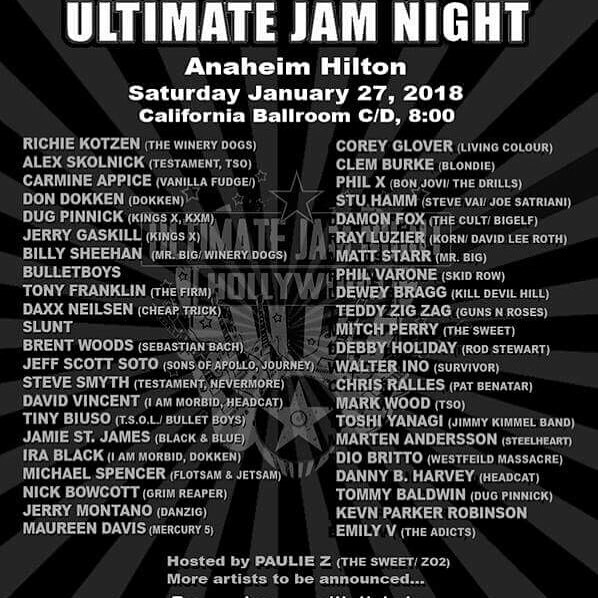 (Anaheim, California) Ultimate Jam Night, the long-running show in residency at the Whisky A Go Go, presents a special edition of its award-winning program at NAMM 2018 on Saturday, January 27 at the Anaheim Hilton California C/D Ballroom. Doors open at 8 pm. As is keeping with its tradition, admission is free. Dubbed “Ultimate NAMM Night” the special-edition show will feature such renowned performers as Richie Kotzen , Corey Glover from Living Colour, Alex Skolnick of Testament, dUg Pinnick and Jerry Gaskill from King’s X, Phil X from Bon Jovi, Billy Sheehan of Mr. Big, Ray Luzier from Korn, Clem Burke from Blondie, The Bulletboys, Jeff Scott Soto from Sons of Apollo, Headcat with David Vincent of I Am Morbid, Slunt, Damon Fox of The Cult and Bigelf, Stu Hamm from Steve Vai, and over 40 other artists. Additional artists will be added right up until showtime.